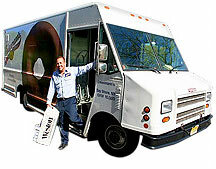 Once the order is received, Entenmann's will process and notify a local route sales representative (RSR) in your area. Deliveries are made on Wednesday of each week, so depending on when an order was submitted, lead times will range from 3 to 9 days (see FAQ section of website for a more detailed overview of the delivery schedule). The RSR will bring the product and invoice into your store. All orders must be paid Cash-On-Delivery (COD). The RSR will collect your cash payment at the time of delivery. Depending on the frequency and volume of a retailer's business with Entenmann's, trade credit programs may be made available subject to a formal credit review conducted by the Company. At the time of delivery, you have the right to inspect the product. If you do not believe the product is of sufficient product quality, or shelf life, you have the right to delete this product from the order, at no cost to you. Once the product has been accepted and paid for, Entenmann's will not issue cash, credit or refunds. All sales are final and "one-way." You assume responsibility for all unsold product.